Acting Healthcare Minister of Ukraine and international partners discuss recent achievements and challenges of immunization in Ukraine. Immunization coverage in Ukraine is very low, much lower than in many less developed countries. Vaccination stands as the only way to protect a child from diseases that may result in complicated, sometimes even lethal consequences. Such unsatisfactory vaccination coverage, among the rest, comes as a result of parents’ fears regarding vaccination. 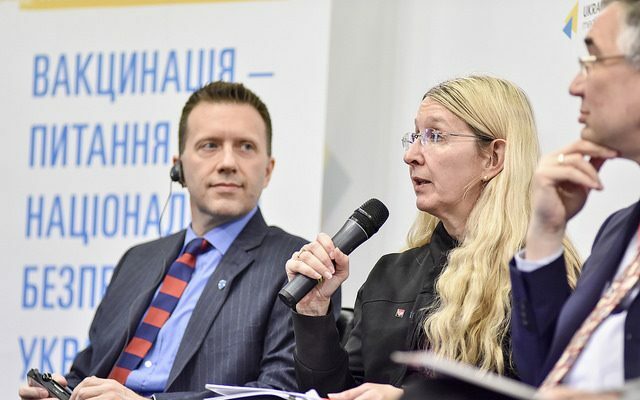 It was stated by Ulana Suprun, acting Healthcare Minister of Ukraine at a press-briefing at Ukraine Crisis Media Center. “Cases of tetanus and measles as well as a lethal case of tuberculosis have been registered in Ukraine. Low child vaccination coverage led to a polio outbreak. Fear of vaccines is a threat to the lives of children. Doctors who refuse [to vaccinate] and use outdated methods, parents who refuse vaccination for no reason, media that spread the fear without actually figuring out the problem are all a threat to children’s lives,” the acting Healthcare Minister emphasized. How to gain parents’ trust? According to the data by UNICEF 74 per cent of parents in Ukraine support immunization, 13 oppose it. In Kyiv this figure is even higher – 18 per cent. Medics’ position is key here. “Medical workers are the most trusted and influential source for parents. Sixty per cent of mothers feel anxious before they vaccinate their children. Eighty per cent of mothers trust the doctors. Last year 16 per cent of doctors were advising against vaccination. We are calling on all parents, medical workers and civil society to use only evidence-based information about vaccines,” said Giovanna Barberis, UNICEF Representative in Ukraine. “There need to be tools that build parents’ trust to the system. Nowadays a person may either read spooky stories in their smartphones or be looking at the scientifically proved information. 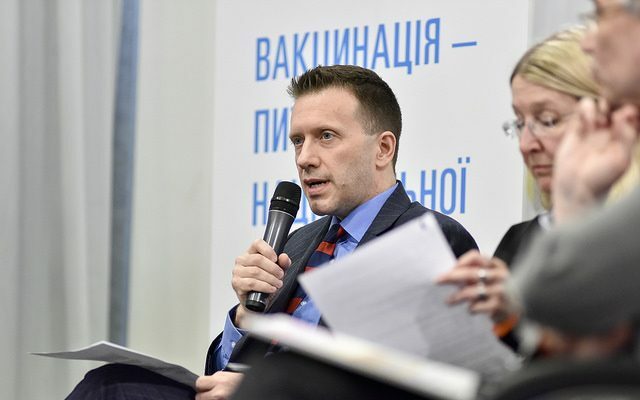 In Canada there is an application that serves as both the immunization calendar and systematizes access to scientific information on vaccines,” said Roman Waschuk, Ambassador of Canada to Ukraine. Ukraine has got big vaccine supplies that were purchased through UNICEF. They are of high quality and they have been extensively supplied to the regions. “When you, parents, come to your doctors and they say that there are no free vaccines, the ones against the diseases that you would want to vaccinate your children from, you have to turn to the regional healthcare department. If you get no feedback from them, address the Healthcare Ministry directly. Vaccines are available,” acting Healthcare Minister Suprun emphasized. Vaccines purchased through UNICEF have passed the re-qualification by the World Health Organization, are in use in other countries and are completely safe. However Ukraine does not have to rely on the international community only. It has to be building its own stable system of vaccines procurement and immunization. “These positive developments [that we achieved] would only have desired impact if we have strong and visible political support from leadership at all levels of the Ukrainian government – from the national level to the raion level, and from the medical community. Procuring vaccines in this manner [through international organizations – UCMC] is neither sufficient nor sustainable. The government must commit to sustain the public funding of vaccines and the national immunization program,” said John Pennell, Deputy Mission Director at USAID Regional Mission for Ukraine, Moldova and Belarus.